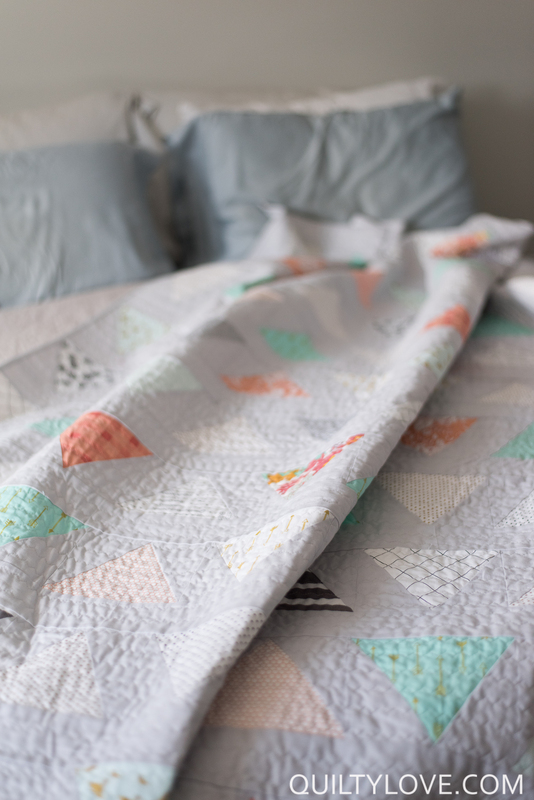 This twin size triangle pop quilt was a joint effort with my daughter. She helped me pull the fabrics for it from my stash. I don’t do enough quilts using mixed fabrics from my stash. Need to fix that ;) Not only is it fun to use up your stash, it sure is nice to make a quilt without spending more money on fabrics for it! I really like the color combos that came from this pull. Pretty aquas, corals and hints of metallics and black and white fabrics. 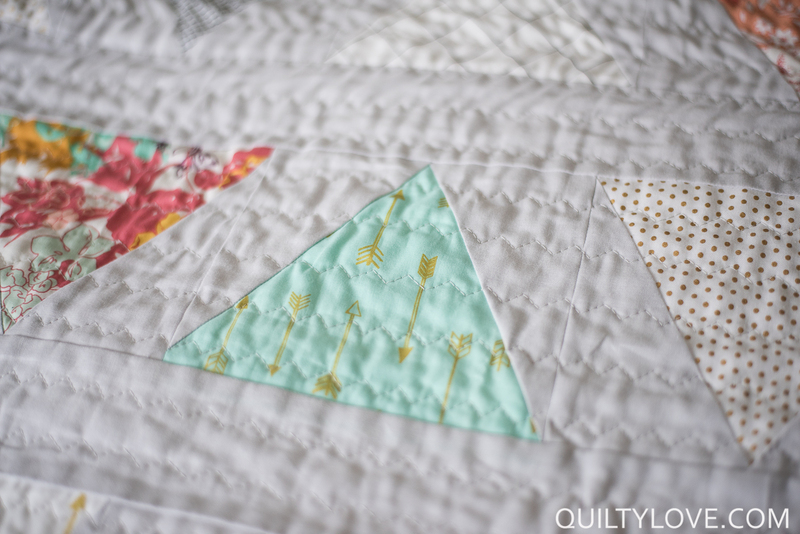 While the quilt pattern comes with a template I recommend this triangle ruler to make this quilt. A good ruler will mean more accurate cuts and faster construction. 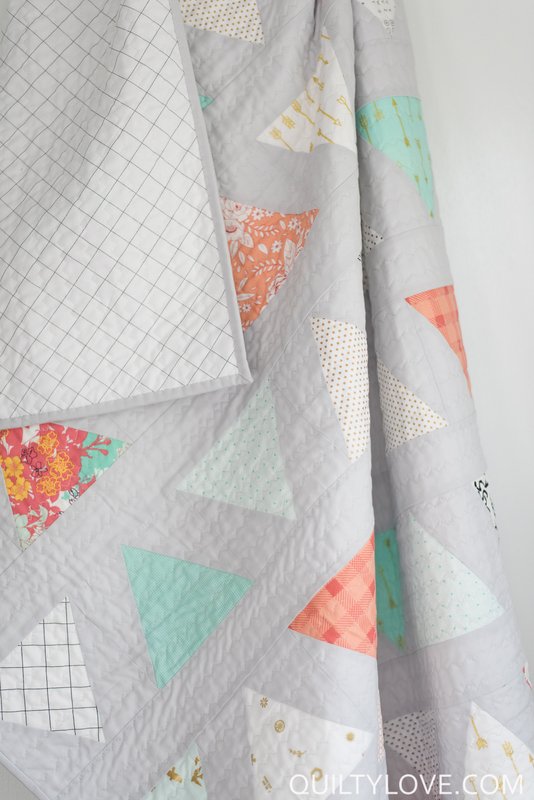 A twin size Triangle pop quilt needs just 14 fat quarters or pull a bunch of larger pieces from your stash like I did for more variety. 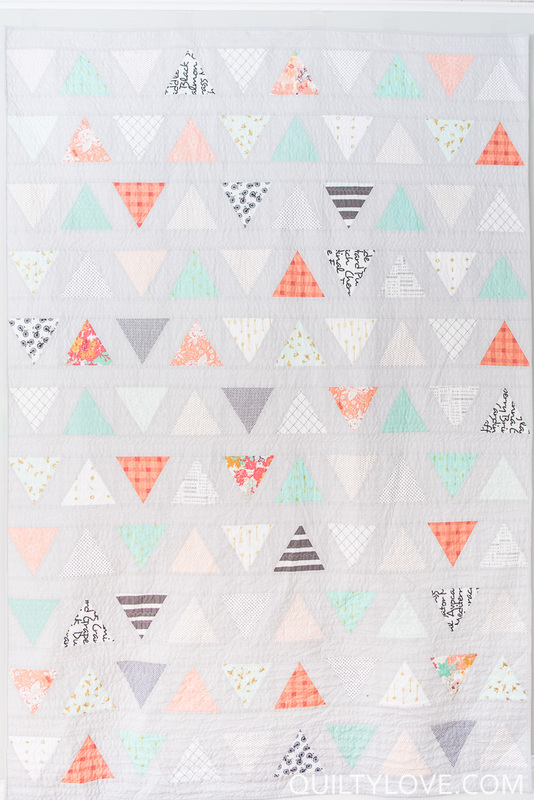 Triangle pop includes instructions to make a baby size quilt, throw size quilt or twin size quilt. 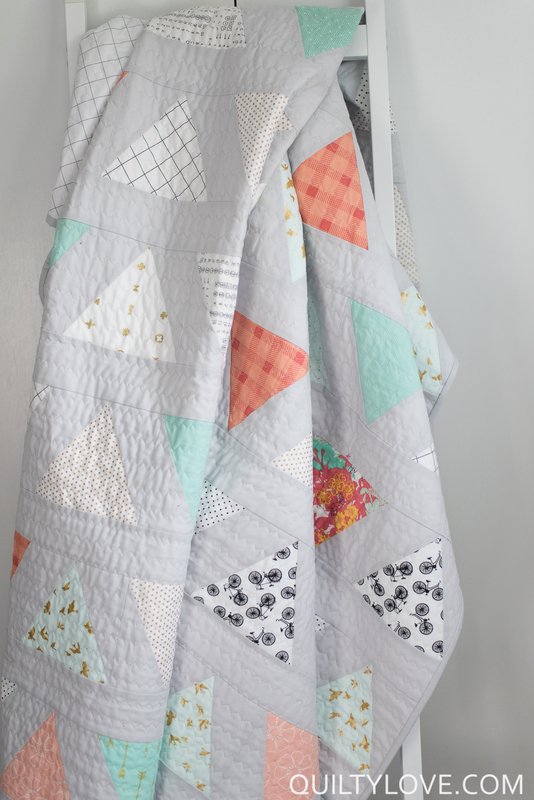 Even at a twin size, this quilt goes together quickly. I quilted this twin size Triangle Pop quilt on my Janome machine. 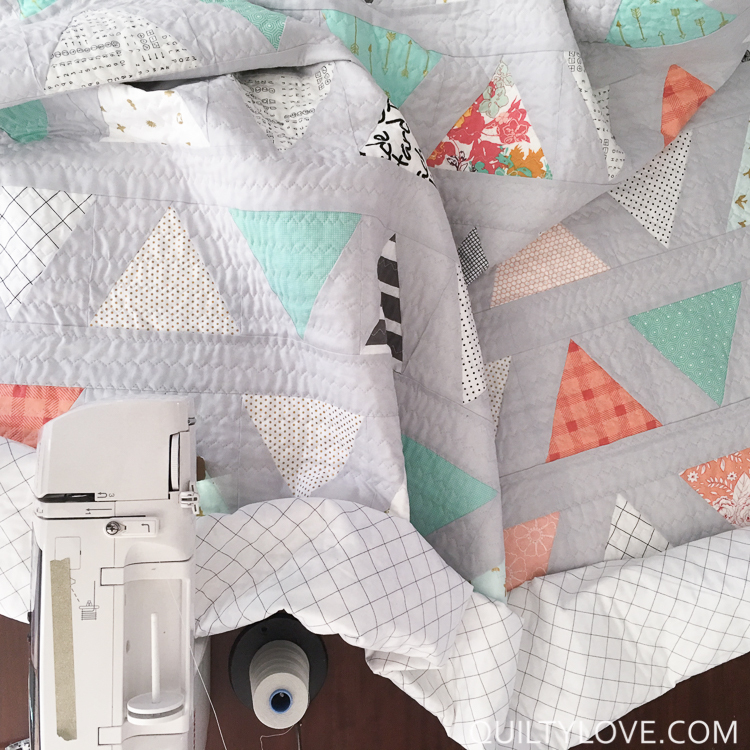 It really wasn’t too hard to wrangle this large quilt in my machine. I used my walking foot to stitch my favorite zig zag stitch. I love the texture this stitch provides. – Find the zig zag walking foot quilting tutorial here. 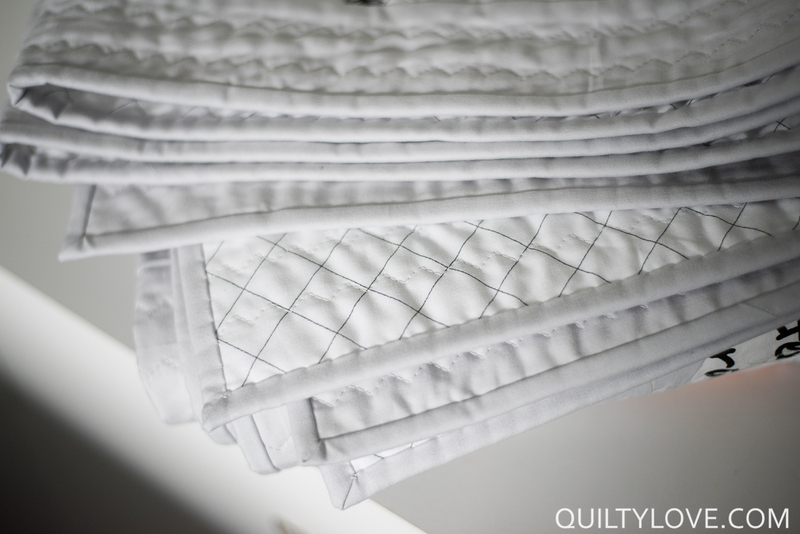 I’m pretty sure I could use white as a background for all of my quilts and be happy with every one….but… white is not the most practical for a bed quilt. So I went with my second favorite background choice, Robert Kaufman Kona in the color Silver. It’s the perfect shade of light cool gray. It seams to work with so many of my fabric choices. 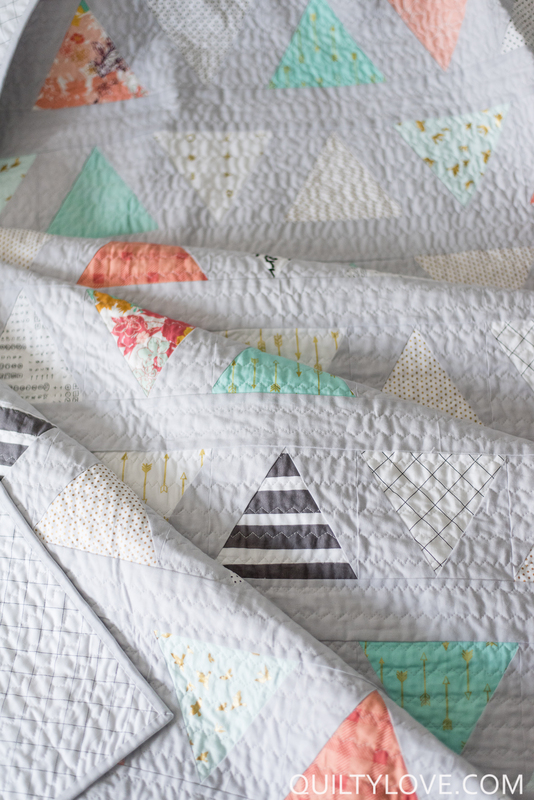 This low volume triangle pop quilt was finished off with a matching silver binding. I like to keep my bindings neutral on my bed quilts by matching them to the background fabric choice. I think the quilt ends up looking a little more modern that way. 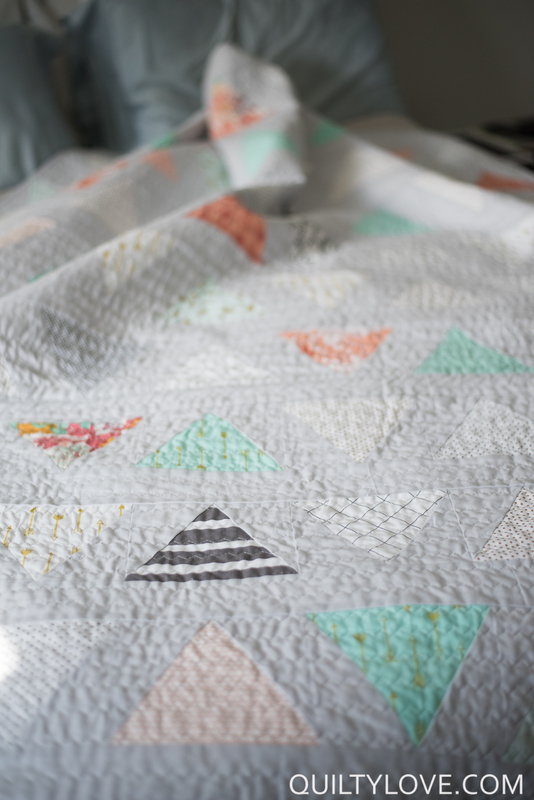 Triangle pop is backed in a Carolyn Friedlander wideback – Trellis Graphite from her Doe line. 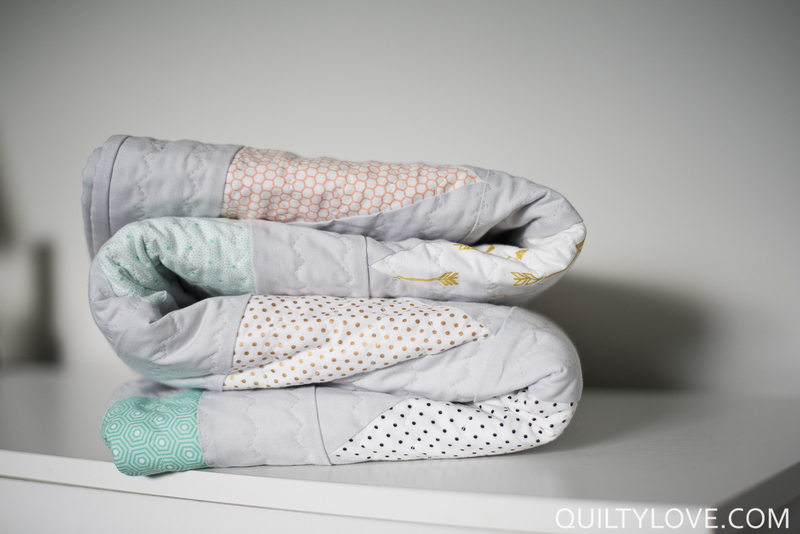 I really love using wide-back fabrics as backings to bed quilts so there are no seams! Wide-back fabrics are 108 inches wide instead of the usual 42 inches. They usually end up much cheaper by the yard too since for most quilts you will only need 1.5 – 2 yards. If you haven’t used a wide-back fabric yet I encourage you to search through these choices for your next quilt. This one is one of my current favorites! 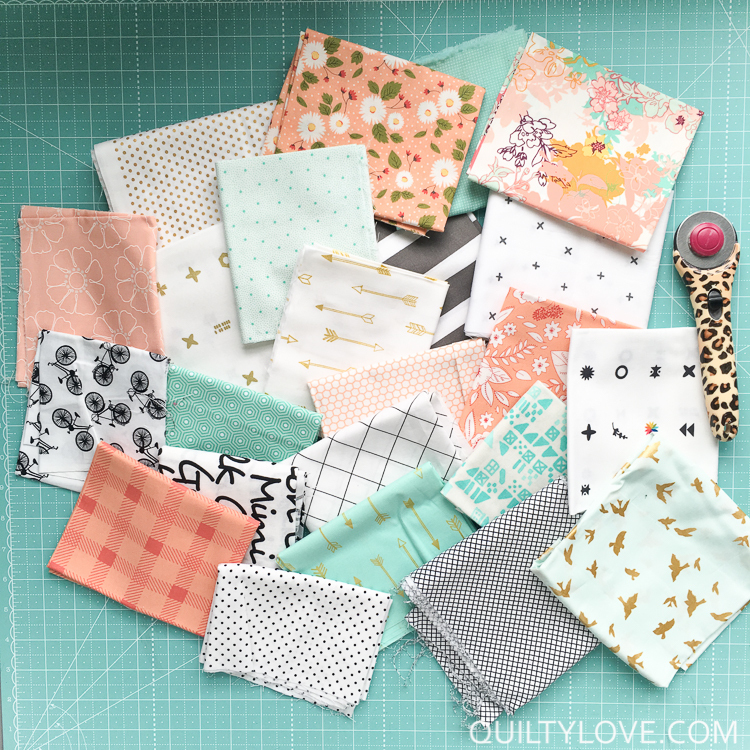 Pick out your favorite fat quarters and pick this pattern up in the Quilty Love Shop! What a gorgeous quilt! I love the colors, the fabrics and the quilting. I purchased this pattern and am making a twin size quilt for my granddaughter. I cut the fabric in 6 inch strips WOF and then used a 60 degree triangle template to cut out the triangles. When measuring my finished blocks they actually measure 6 3/4″ X 5 3/4″. I used 1/4 ” seams. When I checked my template against the one on your pattern and found that your template actually measures 6 1/4″ (I didn’t let the tip of my template go over the edge of the fabric – ugh). Will this be a problem when I sew the rows together – should I make any other adjustments? Hoping this works out. Thanks.